Farm tires are a sub-segment of specialty tires that are used by vehicles and machines employed in farm activities in the agriculture sector. Farm machineries such as sprayers, tractors, trailers, and harvesters some of the most common and key users of farm tires. Choosing the right farm tire depends on numerous different factors such as the size of the tractor tire, soil compaction, fuel economy, traction requirements, and weight of the equipment. 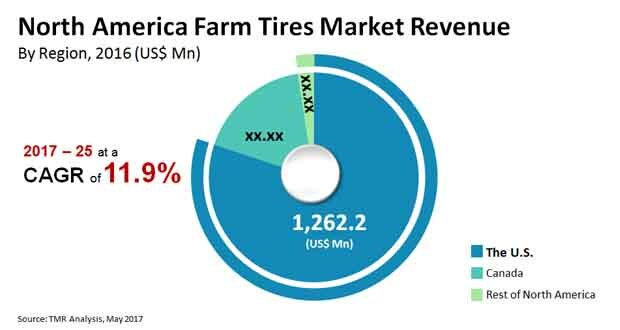 The market for farm tires in North America is witnessing growth at a moderate pace, with the rising preference to radial tires bringing vast changes to the market’s overall growth dynamics. Characteristically better, radial tires cost significantly higher than bias tires of the same dimensions. The disparity has forced several farmers to buy old second-hand tires instead, negatively impacting the sales of new tires and the growth prospects of the overall market for farm tires in North America. However, rising demand from hobby farmers and the increased awareness about the need for mechanization in the field of farming are allowing radial tires good growth prospects. According to Transparency Market Research, the North America farm tire market is expected to exhibit a moderate CAGR of 5.5% from 2017 to 2025 in terms of volume, rising from 2,948 thousand units in 2016 to 4,750 thousand units in 2025. In terms of type, the North America farm tires market has been segmented into bias tires and radial tires. Of these, the segment of radial tires is expected to witness the dominance, in terms of revenue contribution, of radial tires throughout the forecast period. The high costs of these technologically advanced tires allow them to account for a larger share in the overall revenue of the market despite holding a much smaller volume-wise share as compared to the segment of bias tires. The segment of radial tires is expected to continue to hold a higher share in the North America farm tire market in terms of revenue contribution over the forecast period. Nevertheless, the trend of higher sales volumes of bias tires compared to those of radial tires, is expected to continue over the forecast period as well. The vast disparity in costs of bias tires and radial tires, with radial tires costing as much as 10 times the cost of bias tires of same dimensions, plays a major role in cost-sensitive farmers’ preferences. However, the segment of radial tires is steadily gaining traction, with its growth rate, in terms of volume, expected to be higher than that of the segment of bias tires over the report’s forecast period. In terms of revenue-wise growth, both the segments will remain equally competitive, expanding at CAGRs of 11.8% (bias tires) and 11.9% (radial tires) over the forecast period. In terms of geography, the report examines the market for farm tire across the U.S., Canada, and the rest of North America. Of these, the U.S. is presently the leading revenue contributor to the North America farm tire market and the country will continue to hold its top spot owing to the larger scale of the agriculture sector as compared to other countries in the region and presence of several leading vendors. In terms of rate of growth, however, the market in Canada is expected to register a better pace of growth, in terms of both revenue as well as volume. Some of the leading players operating in the North America farm tire market are BKT Tires USA Inc., Bridgestone Corporation, Continental AG, The Goodyear Tire & Rubber Company, Michelin, Mitas Tires Global Inc., TBC Corp., and Titan International. This report is on North America farm tire market provides analysis for the period 2015–2025, wherein 2016 is the base year and the period from 2017 to 2025 is the forecast period. Data for 2015 has been included as historical information. The report covers market dynamics including drivers, restraints opportunities, and trends expected to influence the North America farm tire market growth during the said period. Factors that are playing a major role in driving the North America farm tire market have also been covered in the study. The study provides a comprehensive analysis on market growth throughout the above forecast period in terms of revenue estimates (US$ Mn) and volume estimates (thousand Units), across the U.S. and Canada. Farm tires are a sub-segment of specialty tires that are used by vehicles and machines used for farm activities. Sprayers, tractors, trailers, and harvesters are a few examples of farm machinery that use farm tires. The Farm Tire market is anticipated to witness nominal growth during the forecast period from 2017 to 2025 owing to the factors such as decline in farm output, unfavorable climatic conditions and changing government regulations in the North America region. Increasing demand for food and rise in farm mechanization are some of the factors that are anticipated to drive the growth of North America farm tires market. The market is going to surge due to the rising demand for tractors in the agricultural sector. Presently there is increase in adoption of hobby farming especially in the U.S. and this is expected to positively impact the farm tires market during the years from 2017 -2025. The Farm Tire market has been segmented on the basis of tire types and applications. On the basis of tire types, the farm tire market is segmented into bias and radial tires. Furthermore, application segment has been divided into tractors, harvesters and others (combines, trailers, sprayers, etc.). The North America region wise prominent countries covered in the scope of the study includes - the U.S and Canada. The report covers key developments which provides the historic development in the farm tire market. The report also covers segment wise analysis in terms of revenue and volume, comparison matrix, porters five force analysis, market attractiveness analysis which identifies and compares segments on the basis of CAGR and market share index and provides market positioning of the companies playing important role in the farm tire market. The report also includes comparison matrix which provides the analysis of the segment growth matrix (%), segment revenue contribution from 2017 - 2025 (%), and segment compounded growth matrix (CAGR) This report shows market attractiveness analysis for all the segments and for all the regions in the scope of study which identifies and compares segments market attractiveness on the basis of CAGR and market share index. The report also includes competition landscape which include competition matrix. In these market the company playing major role has been included which provides company description, SWOT analysis, financial data and strategy adopted by companies for the development of company. Competition matrix benchmarks leading players on the basis of their capabilities and potential to grow however, factors including market position, offerings and R&D focus are attributed to company’s capabilities, top line growth, market share, segment growth, infrastructure facilities and future outlook are attributed to company’s potential to grow. This section also identifies and includes various recent developments carried out by the leading players in the farm tire market.